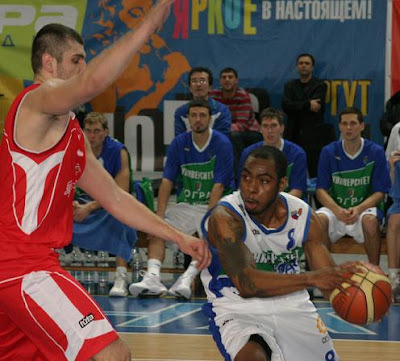 Enisey Krasnoyarsk announced the signing of American combo-guard Lionel Chalmers(1.83-PG/SG) via their official website. Chalmers is a great signing for Krasnoyarsk as he was one of the top scorers last season in Russia. Chalmers has a rich career in Europe and the States. After graduating from Xavier in 2004 he managed to secure a contract with the Los Angeles Clippers where he played 36 games. After that he signed in Greece with AEK Athens but soon after he was sold to Baskonia. Next season he played for Benetton Treviso and finally last season he played for Surgut with an impressive averages of 21 points 4.5 rebounds and 5.2 assists in 22 games in the Russian Superleague. CSKA owner, Mikhail Prokhorov, buys NJ Nets. Mahmudi a favorite for the Italian NT? Jamar Butler to play in Greece? Alba to part ways with Lee Cummard? DSM to sue BC Kalev? If the price is right.. The Rubio saga has almost come to an end..
Dejan Milojevic to end his career? Abdul-Rauf is big in Japan!